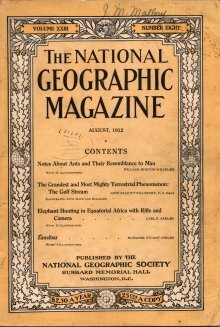 [Left] The cover of the August 1912 edition, that contains a most interesting article on relatively early oceanographic research by John E. Pillsbury, U.S. Navy, entitled ">The Grandest and Most Mighty Terrestrial Phenomenon: The Gulf Stream>" illustrated with maps and diagrams. Availability: boxed, single - some bound volumes. Indexing: by NMA, started, incomplete, is available here. We are actively collecting back issues of this magazine; we have quite a number of doubles and will gladly exchange with other collections. Please E-mail us.